Temperament: The Cavalier King Charles Spaniel should be a happy, friendly dog free from any signs of meanness or aggression. They should not have any tendency towards nervousness or shyness. Grooming: According to the breed standard, the Cavalier King Charles Spaniel should not be trimmed except for hair growing between the pads on the bottom of their feet. 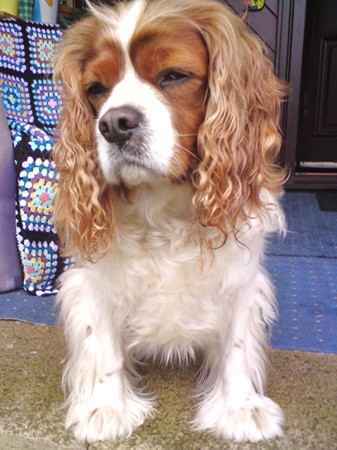 Appearance: Cavalier King Charles Spaniels are graceful and well-balanced dogs. They are active, happy and fearless dogs with great personalities. Cavalier King Charles Spaniels are gentle, affectionate and loyal dogs. It is the superb personality together with their elegance and royal appearance of the Cavalier King Charles Spaniels that truly make the breed. A natural appearance with no trimming or sculpting is essential to breed. Size: A Cavalier King Charles Spaniel should be between 12 to 13 inches at the highest point of their shoulders. Cavalier King Charles Spaniels should between 13 and 18 pounds when fully grown. Head: The head of a Cavalier King Charles Spaniel should be proportionate to the size of dog. Cavalier King Charles Spaniels have a sweet and gentle expression. The skull of a Cavalier King Charles Spaniel should be slightly rounded but not domed or peaked. The top of their head should almost appear flat because of the high placement of their ears. Eyes: The eyes of a Cavalier King Charles Spaniel should be large, round and not set to far apart. They should appear a very warm, dark brown color with dark rims. Cavalier King Charles Spaniels should have some slight cushioning under their eyes which help give them their soft expression. Ears: The ears of a Cavalier King Charles Spaniel should be set high upon their head, but not close to the top of the head. They should be long in length and appear leathery in texture with plenty of feathering. They need to be wide enough so that they can fan slightly forward to frame the face when the dog is alert. Muzzle: The muzzle of a Cavalier King Charles Spaniel should be slightly tapered. The nose of a Cavalier King Charles Spaniel should be black in color without any flesh marks and have well defined nostrils. The lips of a Cavalier King Charles Spaniel should be well-developed with a clean finish. Their bite should be a perfect scissors bite where the upper teeth closely overlap the lower teeth. Neck: Cavalier King Charles Spaniels should have relatively long, muscular necks that flow smoothly into their shoulders providing them with that elegant look. Body: The body of a Cavalier King Charles Spaniel has a slightly square appearance. When measured from their shoulder to base of the tail a Cavalier King Charles Spaniel is just slightly longer than it is tall. The height from the withers to the elbow should be approximately the same as the height from the elbow to the ground. The topline of a Cavalier King Charles Spaniel should appear level both when standing still and in motion. Their body is relatively short with a moderately deep chest that extends to the elbows allowing ample heart room. They should be slightly smaller at the flank than at the last rib, but not have a tucked-in appearance. Forequarters: The shoulders of a Cavalier King Charles Spaniel should be well laid back with straight forelegs. The legs should be underneath the dog with the elbows close to their sides. Hindquarters: The Cavalier King Charles Spaniel should have a broad pelvis that is moderately muscled. When viewed from the back the rear legs should appear parallel to each other. Gait: The gait of a Cavalier King Charles Spaniel should appear elegant and free moving. They should have good reach in front with a sound driving rear action. They should have movement that shows a good length of stride when viewed from the side and appear straight and balanced when viewed from the rear. Feet: The Cavalier King Charles Spaniel should have compact feet with well-cushioned pads. Their dewclaws may be removed. Tail: The tail of a Cavalier King Charles Spaniel should carried happily but not appear too much above the level of the back. The tail should be in motion when the dog is in motion. The tail may be docked, but only up to one third of the length should be removed. Color: Cavalier King Charles Spaniels should be Blenheim which is a pearly white color with rich chestnut markings. Their ears should be chestnut in color as well as evenly spaced on the head and surrounding both of their eyes. They should have white between the eyes and ears and may have a Blenheim spot in the center. This lozenge as it is called is a unique feature and is highly desirable. The tricolor Cavalier King Charles Spaniel should be pearly white with jet black markings. The ears must be black and they should have black evenly spaced on their head and surrounding both of their eyes. There should be white between their eyes and rich tan markings over their eyes, on cheeks, inside ears and on underside of their tail. The Ruby Cavalier King Charles Spaniel should be all red in color. The Black and Tan variety of the Cavalier King Charles Spaniel should be jet black and have rich, bright tan markings over their eyes, on their cheeks, inside their ears, on their chest, on their legs, and on the underside of their tail. Coat: The coat of a Cavalier King Charles Spaniel should be of moderate length, straight or slightly wavy and silky. Their ears, chest, legs, tail and feet should be feathered.